Original Editors - Students from Glasgow Caledonian University's Cardiorespiratory Therapeutics Project. Emphysema can be defined as having a loss of lung elasticity, permanent enlargement of the air spaces distal to the terminal bronchioles, and destruction of the alveolar walls. It can be classified under the umbrella term chronic obstructive pulmonary disorder (COPD)  . There are three types of emphysema; centriacinar, panacinar, paraseptal. Centriacinar emphysema affects the alveoli and airways in the central acinus, destroying the alveoli in the walls of the respiratory bronchioles and alveolar ducts  . Panacinar emphysema affects the whole acinus  . Paraseptal emphysema is believed to be the basic lesion of pulmonary bullous disease . Emphysema is generally found in those less than 40 years old, and more frequently found in those of Scandinavian descent, commonly developing in the 3rd to 5th decades of a life . The disease tends to express no signs and symptoms until 50% of lung function is lost, as a result of the airway obstructions beginning in the smaller airways . 1% of cases of emphysema are thought to be due to the deficiency of the alpha1-antitrypsin enzyme  . The exact cause of Emphysema is still yet to be distinguished, however research is suggesting the prevalence is strongly related to smoking, air pollutions and in some cases, occupation . Another common association is the deficiency of the enzyme alpha₁-antitrypsin, which is the protein protecting the alveoli . The prevalence of Emphysema within the smoking population is believed to increase as smoking is a major risk factor associated. It is thought to have a higher incidence in those with a lower socioeconomic background, therefore affecting lifestyle and environment, resulting in the likelihood of respiratory infection . The alveoli and the small distal airways are primarily affected by the disease, followed by effects in the larger airways . Elastic recoil is usually responsible for splinting the bronchioles open. However, with emphysema, the bronchioles lose their stabilizing function and therefore causing a collapse in the airways resulting in gas to be trapped distally. There is an erosion in the alveolar septa causing there to be an enlargement of the available air space in the alveoli . There is sometimes a formation of bullae with their thin walls of diminished lung tissue. 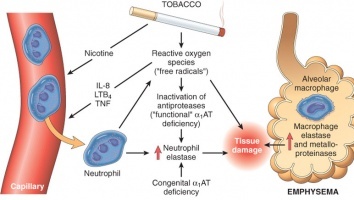 Smoking contributes to the development of the condition initially by activating the inflammatory process . The inhaled irritants cause inflammatory cells to be released from polymorphonuclear leukocytes and alveolar macrophages to move into the lungs . Inflammatory cells are known as proteolytic enzymes, which the lungs are usually protected against due to the action of antiproteases such as the alpha1-antitrypsin . However, the irritants from smoking will have an effect on the alpha1-antitrypsin, reducing its activity. Therefore emphysema develops in this situation when the production and activity of antiprotease are not sufficient to counter the harmful effects of excess protease production . A result of this is the destruction of the alveolar walls and the breakdown of elastic tissue and collagen. The loss of alveolar tissue leads to a reduction in the surface area for gas exchange, which increases the rate of blood flow through the pulmonary capillary system . CT scan is a common method used to diagnosis emphysema. The observations mainly seen to identify emphysema are a decrease in lung attenuation and a decrease in the number and diameter of pulmonary vessels in the affected area . Patients diagnosed with emphysema may complain of difficult/laboured breathing and reduced exercise capacity as their predominating symptoms . The loss of the elastic recoil in the lungs leads to irreversible bronchial obstruction and lung hyperinflation, which increases the volume over normal tidal breathing and functional residual capacity . The main aims of treating patients with Emphysema are to relieve symptoms and to improve quality of life . To measure patients’ quality of life, the St George’s Respiratory Questionnaire (SGRQ) and the Guyatt’s Chronic Respiratory Questionnaire (CRQ) are often completed in order to measure the effectiveness of a treatment intervention . Generally, the diagnosis for Emphysema can be based on clinical, functional and radiographic findings . However, it is thought that mild Emphysema is not well detected on conventional chest radiography, therefore the use of pulmonary function tests (PFT) are often used to try and diagnose the condition . In order to accurately diagnose Emphysema, the history of the patient’s condition needs to be fully understood  . The use of high-resolution CT scans is part of the standard procedure when trying to detect this condition as it is non-invasive and is found to be sensitive in detecting pathological changes related to Emphysema . Physiotherapy management for Emphysema is commonly associated with similar management of COPD. The use of a pulmonary rehabilitation programme consisting of exercise and education can be designed by the physiotherapist along with other members of the multi-disciplinary team (MDT) in order to maximise the patients exercise capacity, mobility and also self-confidence . The other MDT members can consist of a respiratory nurse and dietitians, as well as the physiotherapist in the hope to treat each patient like an individual and meet their specific needs by tailoring a programme to suit them . As COPD is the umbrella term used for diseases like Emphysema, the prevention strategies are very similar. The most common suggestion for preventing emphysema, and such, is to stop smoking, and to avoid breathing in any harmful pollutants . ↑ Voelkel NF, Gomez-Arroyo J, Mizuno S. COPD/emphysema: The vascular story. Pulmonary Circulation 2011; 1(3): 320–326. ↑ 2.0 2.1 2.2 Hochhegger B, Dixon S, Screaton N, Cardinal V, Marchiori S, Binukrishnan S, Holemans J, Gosney J, McCann C, Emphysema and smoking related lung diseases. The British Institute of Radiology 2014; 20 (4). ↑ 5.0 5.1 Haas F, Haas SS. The Chronic Bronchitis and Emphysema Handbook. Chichester: John Wiley and Sons, Inc; 2000. ↑ Mattison S, Christensen M. The pathophysiology of emphysema: Considerations for critical care nursing practice. Intensive and Critical Care Nursing 2006; 22: 329-337. ↑ Health and Safety Executive. Occupational Respiratory Diseases: Work-Related Chronic Obstructive Respiratory disease — Intervention and Evaluation Plans Draft Document. London: Health and Safety executive; 2005. ↑ 8.0 8.1 8.2 8.3 8.4 8.5 Mattison S, Christensen M. The pathophysiology of emphysema: Considerations for critical care nursing practice. Intensive and Critical Care Nursing 2006; 22: 329-337. ↑ Newell, J. CT of Emphysema. Radiologic Clinics of North America 2002; 40 (1): 31-42. ↑ 10.0 10.1 Visca D, Aiello M, Chetta A. Cardiovascular function in pulmonary emphysema. BioMed Research International 2013. ↑ 11.0 11.1 Harper R, Brazierm JE, Waterhouse JC, Walters SJ, Jones NMB, Howard P.Comparison of outcome measures for patients with chronic obstructive pulmonary disease (COPD) in an outpatient setting. Thorax 1997; 52: 879-887. ↑ Naunheim KS, Wood DE, Mohsenifar Z, Sternberg AL, Criner GJ, DeCamp MM, Deschamps CC, Martinez FJ, Sciurba FC, Tonascia J, Fishman AP. Long-term follow-up of patients receiving lung-volume-reduction surgery versus medical therapy for severe emphysema by the national emphysema treatment trial research group. The Annals of Thoracic Surgery 2006; 82 (2): 421-443. ↑ Klein JS, Gamsu G, Webb WR, Golden JA, Muller NL. High-resolution CT diagnosis of emphysema in symptomatic patients with normal chest radiographs and isolated low diffusing capacity. Radiology 1992; 182: 817-821. ↑ Sanders C, Nath PH, Bailey WC. Detection of Emphysema with computed tomography correlation with pulmonary function tests and chest radiography. Investigative Radiology 1988; 23: 262-266. ↑ 15.0 15.1 Zaporozhan J, Ley S, Eberhardt R, Weinheimer O, Svitlana I, Herth F, Kauczor H-U. 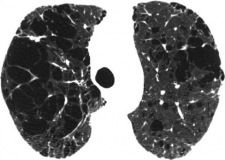 Paired inspiratory/expiratory volumetric thin-slice CT scan for emphysema analysis: comparison of different quantitative evaluations and pulmonary function test. American College of Chest Physicians 2005; 128 (5): 3212-3220.